Russell Kiernan, QED National’s Director of IT Management Consulting and Information Security Services, is presenting “Managing End-of-Life Risk” as part of the line-up of subject experts speaking at the 20th Annual New York State Cyber / Information Security Conference on June 7-8, 2017. 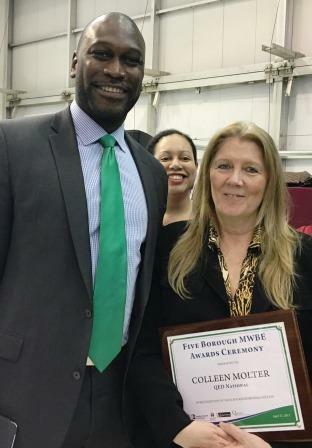 Colleen Molter, Founder and President of QED National, has received the 2017 Minority and Women-Owned Business Enterprise (MWBE) Award from the 5 Boroughs Chamber Alliance of New York City. The annual award recognizes excellence in small business leadership by minority- and women-owned businesses in the City of New York. Each of the five Chambers of Commerce selects two outstanding business leaders from their community to receive this honor.